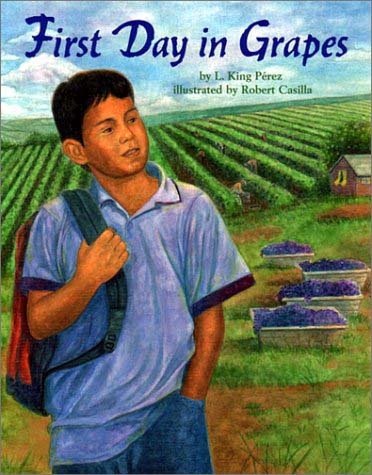 First Day in Grapes chronicles young Chico’s first day in yet another school, where he is apprehensive because of previous experiences with bullying and name-calling. But, after he meets some new friends and a caring young teacher who “can crack a home run over the playground fence,” drives back two mean kids from fourth grade with his remarkable math skills, and charms a surly bus driver, who “looked as mean as a crew boss,” Chico gains a sense of pride and accomplishment. Although Casilla’s illustrations—rendered in watercolor, colored pencil, and pastel—show real people and give warmth to the story, the story itself is just not convincing. A far better choice for this age level would be Linda Jacobs Altman’s Amelia’s Road. Marginally recommended.